There was drama of the wrong kind in the men's marathon yesterday. With only 5km left in the race, the then leading runner, Vanderlei de Lima was accosted by an intruder, and delayed for five seconds as he tried to escape. Visibly shaken, de Lima fell back and took only bronze. The eventual gold medallist, who took the lead in the final stretch, was Italy's Stefano Baldini. He broke the course record with a time of 2:10: 55 - but the outcome was tainted with injustice and uncertainty. The incident happened one hour and 52 minutes into the race, when de Lima - who at the 35km mark had held a lead of 28 seconds - was tackled by a figure with a shag of hair and green clothing, who had run on to the course from the roadside divider. Bystanders and the police grabbed the intruder, who carried a prophetic message on his back and has a record of similar disturbances. Police identified him as an Irishman, Cornelius Horan. The Brazilian picked up his pace, but his concentration and rhythm had snapped. With the crowd of perhaps 50,000 at the Panathinaic stadium cheering him at the finish line, de Lima's features were stormy. His lips twisted some message of frustration to himself. The race was determined in the final stretch through Athens' centre, when first Baldini and then the American Mebrahtom Keflezighi pas-sed the Brazi-lian in the neighbourhood of Ambelokipoi. De Lima held on to third, and received the lion's share of cheers upon entering the stadium - but his medal was bronze due to forces beyond his control, not to mention that of the police and barriers. Brazilians at the finish were devastated. Felipe Vasconcelos of Rio de Janeiro said, "It shouldln't have happened. You don't get a gold medal every day and someone held him up for five, 10 or 20 seconds." Nonetheless, a festive parade of de Lima's compatriots, beating drums and singing, made their way after the finish down a still car-free Vasilissis Sofias to the Parliament building and Syntagma Square. Earlier, it had taken some time for the frontrunners to emerge. More than 100 athletes had left from Marathon at 6pm, to try their fate on the recently widened and rebuilt road in the hot afternoon sun. Some 10km into the race, 62 of them were still within 10 seconds of each other. De Lima was among the men in the front row. 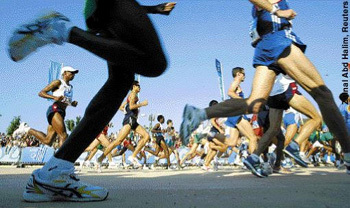 There were several attempts for runners to break ahead, including both the Brazilian, but the order was far from fixed. At the 15km mark, Lybia's Ali Mabrouk El Zaidi took the lead, followed in turn by South Africa's Hendrick Ramaala - but neither could maintain the pace of the pack, set by those including favourite and world record holder, Kenya's Paul Tergat. El Zaida was ultimately to come in 39th, Ramaala to drop out of the race, Tergat to finish a disappointing 10th. At the 20km mark, amid the most difficult parts of the course, Vanderlei de Lima took the lead. He was followed by Baldini and Ramaala. By the half-way point of the race, Lima had edged ahead of a 20-strong pack by a full 15 seconds. With the roadside crowds cheering, de Lima picked up the pace. At the 25km point, he was ahead by 35 seconds, followed by Morocco's Gharib, Baldini, Tergat and Japan's Aburaya. After passing the Church of Pallini, the Brazilian may have looked tired, but he kept a 40-second lead. At 35km, Lima's lead had shrunk to 28 seconds, with a persistent Baldini and Tergat close behind. By now Keflezighi, the eventual silver medallist, had moved up into the fourth spot, followed by Jon Brown of the UK, who was ultimately to finish fourth. Then, however, came the protester's untimely intervention. Greece's Nikos Pollias was never among the front-runners - but he moved his way steadily from 60th at the 25km point to finish 23rd of a final 76 finishers, in perhaps the fastest run the Athens Marathon will ever see. Heidi Makrinioti of Thebes said she was thoroughly moved by the event, ending as it did in the stadium where the modern Olympics began. A Roman in the crowd pointed out that he feels that the gold marathon medal is the most important - and hardest to get - in the Olympics. But Patricia Atsalis, a running enthusiast from New Zealand, summed up the feelings of most observers. She said: "I was thoroughly enjoying it until that idiot ran out."